can reach and maintain your ideal weight. 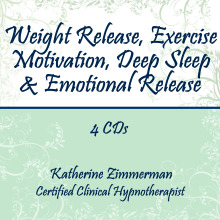 This four part program helps you to change your eating habits, restore natural sleep cycles, increase exercise and release emotional baggage. exercise motivation CD for 3-4 weeks or until you have reached your goal.